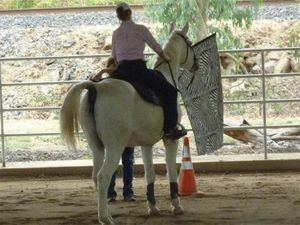 ~ New riders learn to groom and tack their horse and begin riding on a lead line in the care of their instructor. They learn the basics of balance and riding disguised through a game/play based program. 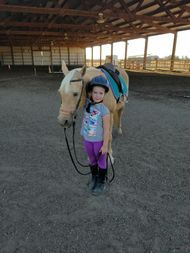 After the riding lesson, they learn to "undress" their horse and put them away. ~As they progress they will learn through a series of drills and exercises designed to improve their horsemanship skills. At this stage, they are ready to really begin the process of a lifelong education. Riders will begin their comprehensive riding program and will learn to utilize their skills in the show ring. 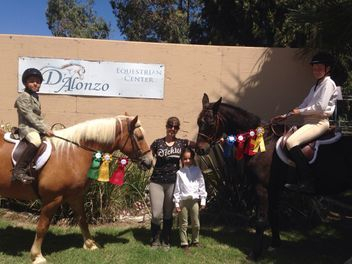 ~Lessons are available for any rider at any age and level that is not interested in competing, Such as adults just getting into riding or who are getting back into the saddle again. As well as experienced riders who want to hone their skills, need problem resolution or want to develop a true partnership with their horse. Students must wear the proper attire when riding. ¨ Riding boots - with a short heel. Please no tennis shoes after the 4th lesson. ¨ Helmet – I do provide one at no additional charge. ¨ Riding pants - Leggings or Breeches/Jodphers are acceptable. No shorts please. 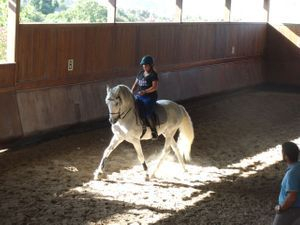 "I use a resistance free system that sets the horse up so that he wants learn. I can not force him to suddenly know what I want him to do, I can however guide him in the right direction so that the horse figures it out on his own; i.e., my goal becomes his goal. This builds self confidence in the horse and trust in the handler. When the next task comes along you have a happy willing partner ready to figure out the answer. Horses have a tremendous sense of feel. They feel a fly land on the surface of their body. As a result, it doesn't seem necessary to use the force sometimes seen to obtain a result. Often, goals are not obtained because conflicting directions are being given; i.e. pulling on the mouth to "set" the head while asking to move forward. Step-wise requests are more clearly understood, and any try must be rewarded immediately to be understood. Long term goals should be broken down into small steps so that every riding/handling session is rewarding calm and effective. I encourage the owners to participate in the training. I want you to learn how I do it so that there is no confusion or frustration when you are working with your horse later on. " 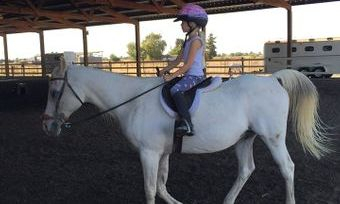 *Horses in Training must board with Aleya.